This is the 12th in a series of class notes as I go through the Georgia Tech/Udacity Machine Learning course. The class textbook is Machine Learning by Tom Mitchell. This marks the start of a new miniseries on Unsupervised Learning, the 2nd of 3 sub disciplines within Machine Learning. Given an input space X, and an objective (aka fitness) function f(x), Find x from X such that f(x) is the maximum possible it can be. This is similar to the argmax function we have used in prior formula, but now we are actually exploring methods to do it. Given a small X, we can simply run a for loop like this one and keep track of the highest values. Given an infinite X but with a solvable df(x), we can use calculus to help us find optima. If df(x) can't be solved, we can use the Newton Raphson method to iteratively get closer and closer to the optimum. However, it can get stuck in local optimum. But what happens when we don't have a derivative to work with? (for example, you don't even know what f(x) is, you just know the output without knowing its theoretical maximum) and possibly many local optima? The simple solution is, to guess a few starting points and then guess a direction and try to do some random restart hill climbing. However, to do it right, you'd have to do a number of restarts and it turns out to be not a lot better than just looping through the entire space especially for spaces with narrow global optima basins. Random Restart Hill Climbing combines exploring (random restart) with exploiting (climbing). Maybe we can split that up. 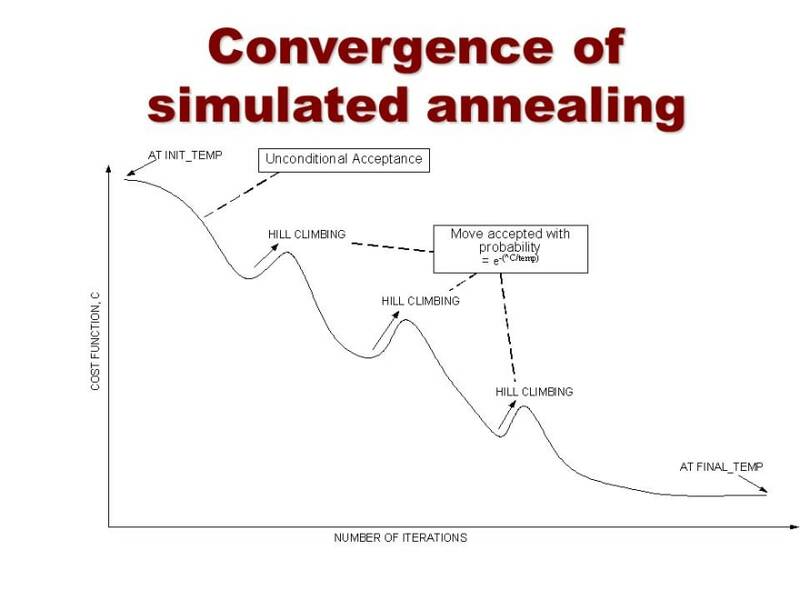 Simulated Annealing takes its name from metallurgy where repeatedly heating up and cooling down a sword makes it stronger than before. So a high T makes the algorithm behave like a random sampler, and as it cools, it starts to behave more like a hill climber. A remarkable analytical result about SA is that the probability of it ending at X is equal to e ^ (f(x) / T) / Z(T) (a Boltzmann distribution) which makes the likelihood of its ending point directly related to its ending point's fitness. Evolution is a pretty good optimizer, and we can simulate that by "breeding" individual points to produce hopefully better offspring and "mutating" them by doing local search. Over multiple "generations", the hope is that we evolve towards the globally optimum result. One feature that helps a lot is if the individual dimensions/attributes can be additively combined, so that breeding two parents can regularly produce better offspring. To contrast this with the other methods, GAs are like random restarts done in parallel (since each individual in a population is like a thread, and each generation is like a restart), EXCEPT that the "crossover" of information when "breeding" happens helps to direct the general direction of evolution towards better places. Crossover/Mutation also has nuances. Deciding on what attributes can be treated as a group involves domain knowledge and implicit assumptions that may or may not reflect reality. A special case is "one point crossover", where if an individual has n bits, a child takes n/2 bits from one parent and the remaining 1-n/2 bits from another parent. This implicitly assumes some grouping in the left and right halves which may or may not reflect reality. "Uniform crossover" makes every bit randomly inherited from each parent instead. As you can see, there are many ways to tackle the problem of optimization without calculus, but all of them involve some sort of random sampling and search. MIMIC: Finding Optima by Estimating Probability Densities estimates a probability distribution in lieu of a genetic algorithm metaphor. When theta is at a minimum, that means we uniformly sample over the entire space. When theta is at a maximum, that means we converge on one or more global optima. Therefore, under MIMIC, our task is to continually raise theta until we just have small regions around our optima left. 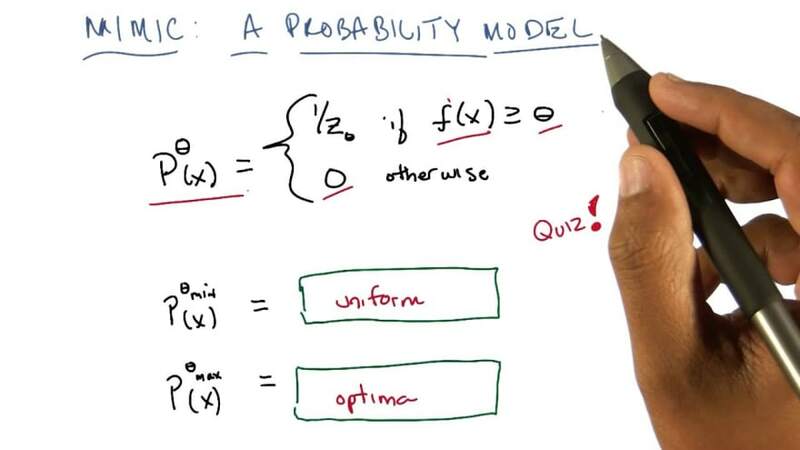 In the process of doing so, we infer a (uniform) probability distribution around our optima. Because we use the nth best percentile as our cutoff factor, this is similar to genetic algorithms, however there is no longer a concept of breeding or genes. 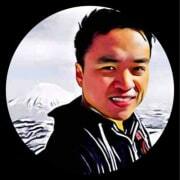 Instead, we stay laser focused on performance against the fitness function as our one metric. The comparison with genetic algorithms isn't accidental - the best version of MIMIC estimates distributions by assuming that the conditional distributions inherent in the space fit to "dependency trees", which are Bayesian Networks where every node (but one) has exactly one parent. Finding these trees is out of scope but check the videos for the math, but the theoretical grounding of this approach is rooted in maximizing Mutual Information (in information theory terms) and building a Maximum Spanning Tree. While not the only way to estimate the next probability distribution, Dependency Trees allow capturing of parent-child structure without having exponential cost (Max Spanning Trees are only polynomial in cost). This is what MIMIC stands for: Mutual-Information-Maximizing Input Clustering! The fact that MIMIC's "rising theta" approach can be used with any underlying probability distribution is pretty cool - here's a simple applied example.